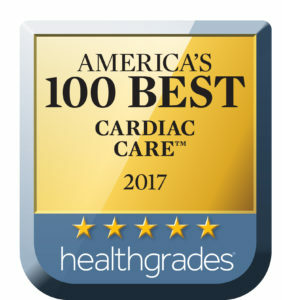 FALL RIVER, Mass – Southcoast Health today announced that it has been recognized as one of America’s 100 Best Hospitals for Cardiac Care for the sixth year in a row by Healthgrades (2012-17), the leading online resource for healthcare consumers. Southcoast Health is one of just four hospitals in Massachusetts to receive this distinction for six consecutive years. In all, Southcoast Health was recognized for superior cardiovascular services with 13 recognitions, including receiving the Healthgrades Cardiac Care Excellence Award for the 11th year in a row (2007-17). These achievements are part of new findings and data released this week on Healthgrades.com and in the Healthgrades 2017 Report to the Nation. For its analysis, Healthgrades evaluated approximately 40 million Medicare-patient records for nearly 4,500 short-term acute care hospitals nationwide, assessing hospital performance relative to each of 34 common conditions and procedures. Detailed performance information, such as cohort-specific outcomes data and quality achievements, as well as more information on the Healthgrades 2017 Report to the Nation, including the complete methodology, can be found at www.healthgrades.com/quality.